Silverhair is a science fiction novel by the award winning author Stephen Baxter. This book is very quirky in that it forces us to see from a new perspective. For anyone who's ever read Raptor Red the concept of this book will most likely be familiar. 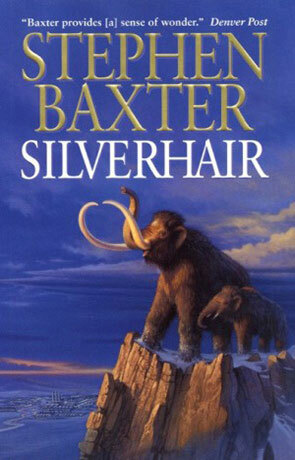 Baxter has decided to craft a story centering around the life of a young woolly mammoth female named Silverhair. As the book starts we are eased into the story that at this point feels like just what you expect it to be. Early on, a small group of people on a boat (people are known to Silverhair as "The Lost") are noticed by Silverhair. The book throws its first curve-ball at us a while later and we begin to realize that as similar as it first seemed this is not Raptor Red. Through a very clever technique, Baxter explains that mammoths through a complex system of rumbling, stomping, trumpeting, and body language, can communicate with one another in complex manners. From this point on he gives us dialog between the animals. This makes the animals feel human to us and allows the reader to identify with Silverhair. The next curve-ball (if you haven't been looking at the cover too closely) comes as we discover that the book takes place in present times; once again this allows us to identify with what is happening. From here the story builds somewhat predictably as the stranded Lost discover Silverhair and her family and try to destroy them. At one point Silverhair is taken captive and it is at this moment that the book begins to really shine as we are given a look at the human spirit from the outside. It can be painful sometimes to watch as the humans do horrible, yet astutely possible things to Silverhair. Through this segment the development of her character is almost relentless, and when compared to her personality at the start she really does change. Most of what the book accomplishes is allowing us to see ourselves from another vantage point, something that literature sometimes has a difficult job doing. We are allowed to see the actions in the book, and to a larger scale around the world, as what they are: foolish and mean-spirited. For a species obsessed with bending the world to our needs I think we sometimes loose sight of why we strive so hard to change. We also seem to loose where we came from and in this way the mammoths really do have us pegged as The Lost. This is an excellent action story that also has a clear underlying theme; whether or not we find our place in the cycle is not clear but this is a great book all the same.